When you read classic literature or a story that speaks to your inner thoughts, do you feel transported? As you become immersed in the plot and identify with the characters, do you wonder what it may have been like to live during that time period in history? If you are fan of Jane Austen’s romantic, humorous fiction, you now have a place to go and visit in the Twin Cities — The Living Rooms. You are invited to go sit in a similar reading and drawing room designed after the late 1700s to early 1800s time period. You can satisfy your craving for Austen’s style of writing by sitting down to read pages of her book while seated in a handsome, dark wood paneled room in two warm, welcoming relaxed, wing back yellow chairs with playful pillows with the printed words “sit” and “stay” to beckon guests to sit a spell and read. The Jane Austen Living Rooms are now free and open for guests who visit the Minneapolis Institute of Arts now through June 26. 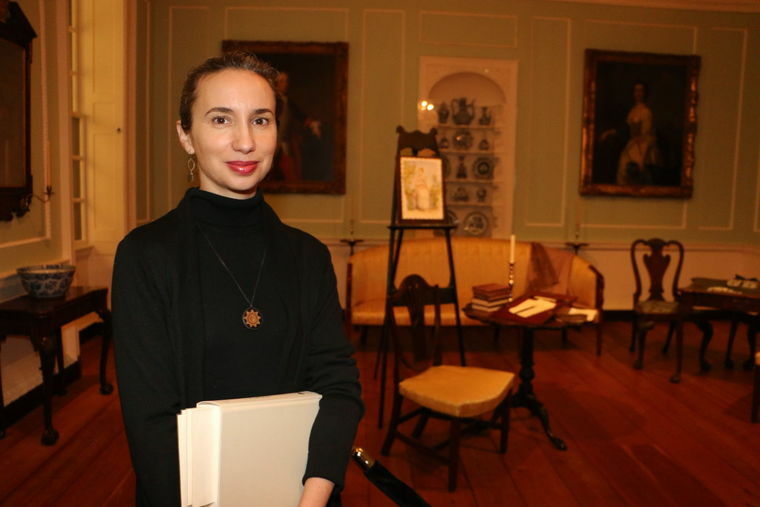 “The two main ideas driving the installations are really bout Jane Austen as an author and historical figure and what her writing process was like and her career as a writer,” said Nichole LeBouf, co-curator of the two Jane Austen Living Rooms. This 19th century period room captures the ambiance with English furnishings. This room is furnished with a yellow velvet upholstered love seat and chair, a portable desk and a drawing art board. “Yellow was a very important color back then — is was called chromium yellow because it was one of the first chemical dyes popular in the early nineteenth century . . . it evokes that spirit,” said LeBouf who gave a guided tour. Shawls are draped across the furniture to represent how the character Emma’s father was somewhat of a hypochondriac. An antique drawing board is a living room focal point because Emma was somewhat of a matchmaker for her friend Harriet. In the book Emma was painting a portrait of Harriet to give to a young gentleman suitor. A 19th century antique portable writing desk is very similar to one used by Jane Austen to write her novels and can be compared to today’s computer laptop. Austen traveled with her mobile desk outfitted with a small lock and was filled with stationary, writing implements and money. In between the two period rooms is a museum glass case filled with Jane Austen rare books. The books are open faced so guests can see the fine art work illustrated on the book pages. Austen fans can again read a few excerpts from the classic writings. These books are a shared collection from Jane Austen’s Living Rooms co-curator Gina King, an art and rare book collector who is a huge Jane Austen fan. At the period room entrance outside the Living Rooms, guests can view a large, flat screen TV that plays a historical video with images and narration that tell the story about the life and works of this British author. Classic English writer Jane Austen lived from 1775 to 1817, and today is well known for her romantic literature taught in many high school and college English classes. As an early feminist, Austen’s literary works were heralded as great English literature as she wrote with humor, irony, social commentary and realism. Many romantic novel plots centered around the dependence of women on marriage to secure social standing and economic security. She achieved literary success as a published author with her popular novels, “Sense and Sensibility,” “Pride and Prejudice” and “Emma” that were made into plays and movies. Jane Austen’s biographer Park Honan wrote how she grew up in a home filled with “an open, amused and easy intellectual atmosphere,” where ideas the family might disagree about in regards to politics or social standing were always considered and discussed. The second half of the 20th century brought the emergence of a popular group called the Janeite fan culture.